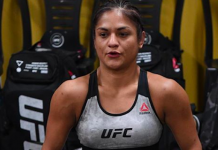 A key women’s strawweight scrap between surging contender Cynthia Calvillo and former champion Carla Esparza took place on the main card of tonight’s UFC 219 event in Las Vegas. Round one begins and Esparza rushes in and lands a nice right hand over the top. Both women are swinging wildly early on here. Both ladies connect with right hands. Esparza scores with a hard low kick and then circles out. Calvillo leaps in and scores with a double leg takedown. She immediately moves to half guard and begins working some short shots. Esparza is throwing more from her back at the moment but Cynthia is working on trying to advance her position. Esparza is able to get back to full guard and then throws up an armbar attempt. Calvillo could be in trouble here. Esparza cranks the hold but Cynthia moves and breaks free. Calvillo instantly passes to side control and begins working some elbows. Still, Esparza continues to land a lot of shots from her back. Calvillo moves to mount and then tries to take the back. Esparza scrambles and winds up in top position. She lands a couple of shots before the horn sounds to end round one. Round two begins and Esparza lands a crisp right hand over the top. She follows that up with a hard low kick. Esparza’s striking has really improved. Both women seem willing to stand and trade. Carla with another hard right hand. Calvillo decides to clinch up and then lands a hard left hook. Esparza did not like that. She circles off the fence. Calvillo catches her with a left hook. Esparza lands a nice right hand in response. She shoots in for a takedown but Cynthia is not having it. Calvillo with a right hand. Esparza shoots in again but she can’t secure the takedown. 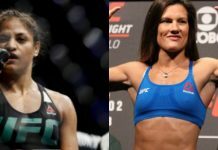 Both ladies connect with big right hands. Carla misses with a left but then scores a nice double leg takedown. Carla with a big shot. Cynthia scrambles back up to her feet. Carla with a hard leg kick. ROund two comes to an end. Round three begins and Carla lands a right hand. Cynthia responds with a nice left. Esparza shoots in but cannot secure the double leg takedown attempt. Calvillo presses Carla against the cage. Esparza breaks free from the fence and lands a left. She follows that up with a leg kick and then another. Calvillo with a nice left jab. Both ladies lands low kicks. Esparza throws a superman punch that just misses. She lands a low kick. Calvillo with a jab. Esparza shoots in for a takedown. It is not there. She circles and lands another nice low kick. Esparza takes the center of the octagon and lands another heavy low kick. 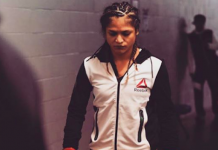 Calvillo shoots in and presses Carla against the cage. Esparza with a nice left hand on the break. Calvillo continues to press forward. She lands a left hand. 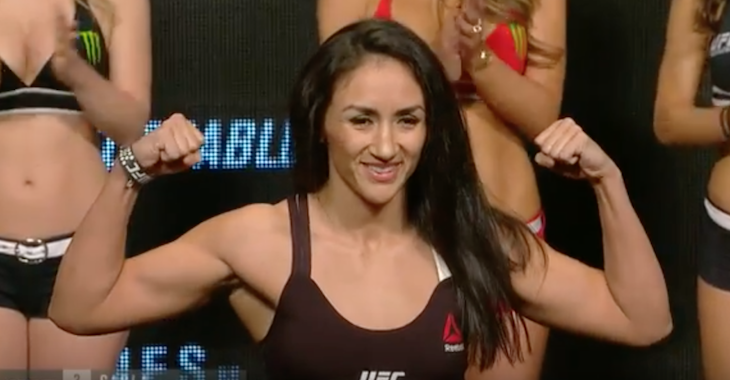 Esparza shoots and briefly scores a takedown but Cynthia is right back up. Thirty seconds remain. Carla lands a low kick. She comes at Cynthia with a flurry. What a fight!